This is indeed, an unfortunate accident. However, we can all learn from this. I heart goes out to this lady. She must feel terrible. I am very sure it was unintended. The Punishment by the law does not really condemn her as a person. It just makes her responsible for what happened and I think she has taken responsibility for it. It is not easy to filter at road bends, and especially so for unskilled drivers (occasional driver). Be very sure of your driving skills and ask yourself, "Do I really need to filter... here... and... now?". It is already very difficult to view things using the rear-view-mirror, and doing it while you are at the bend makes it even more difficult. When you look in the rear-view-mirror while you are at the road bend, you are seeing what is behind your car... BUT not the whole stretch of road behind you... so you will have to take that into consideration. When checking your rear-view-mirror, and especially at road bends... you must check all the way back and as far as the eye can see by checking the lane you are in, as well as the adjacent lanes to your left and right. At road bends... this means following the curve of the road behind you. This will need a lot of time to do, so make sure you have that time. SINGAPORE - A woman who ran over and killed a motorcyclist after failing to check her blind spot while changing lanes was fined $7,000 on Tuesday. Client relations officer Norizah Samad, 31, was also banned from driving for five years after admitting causing the death of Mr Muhammad Shaheen Abdullah, 32, through her negligence. She had been driving in the left lane of Bedok North Street 3 - a one-way, two-lane road - last Oct 29 when she tried to filter into the right lane after a right bend. After checking her rear view and right side mirrors, she turned her head to the right and signaled right before proceeding to filter. But she failed to properly check her blind spot and did not see the victim's scooter travelling in the right lane beside her car. She only spotted him after half of her vehicle had entered the right lane - but by then it was too late and the car hit the victim's scooter, causing the victim to be flung off his machine and land in front of her car. Despite jamming on her brakes, she could not stop the car from running over the victim and going up the right kerb. 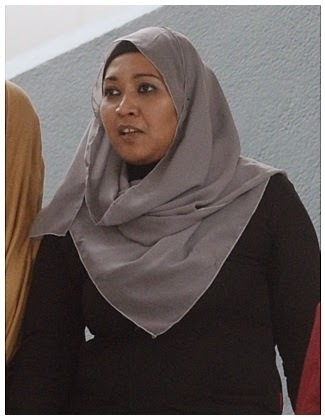 Norizah's lawyer Rajan Nair said his client, a mother of two, was an "occasional driver", having obtained her driving licence four years ago. He said she does not intend to drive again. Norizah could have been jailed for up to two years and/or fined for causing death through a negligent act. 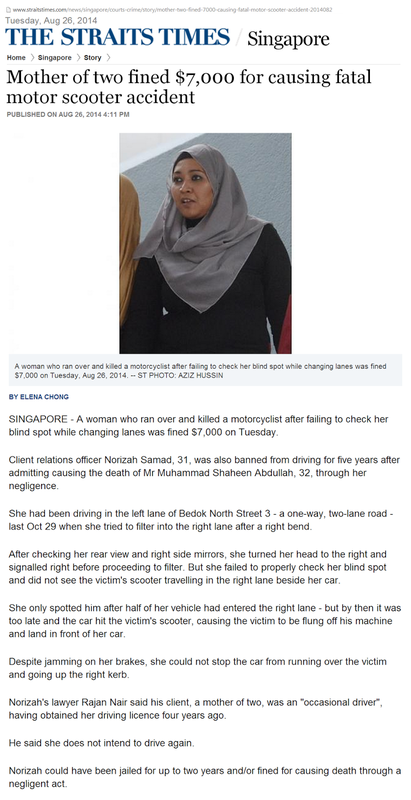 A woman who ran over and killed a motorcyclist after failing to check her blind spot while changing lanes was fined $7,000 on Tuesday, Aug 26, 2014.